Preparing your child for the start of his or her college career is filled with anticipation, expectation, excitement, concern, and of course, packing! You want your child to succeed and to be happy and healthy. The transition from high school to college presents new challenges and opportunities. Adjusting, coping, learning are all ongoing processes. As a parent, you struggle yourself as you see your children in difficult situations. Worried about how your child will fare at school? You're not alone! My child has trouble with stress management; will this get worse while he's away at college? What if she has problems with her roommate? My child really bombs out when things don't go right. How will he manage this when he's at college and I'm not there to help? I'm always telling my child how important it is to do well, but she doesn't seem to listen. These years are so important, yet my child doesn't seem to take it seriously. Who will help my child with daily activities such as eating and laundry? I've always handled that. 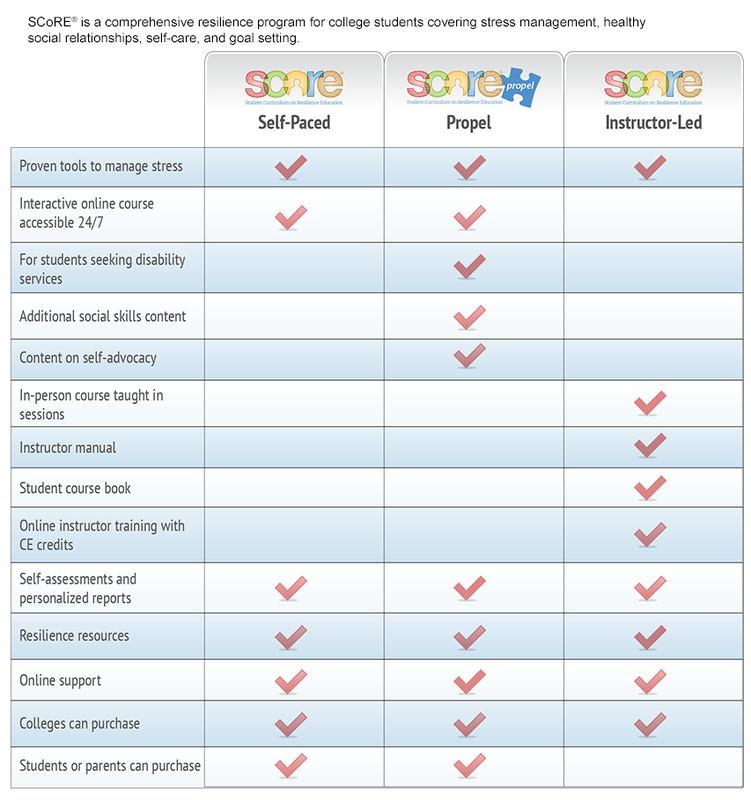 SCoRE® (Student Curriculum on Resilience Education®), a research-based program, was developed so students can identify and cope with the personal, social, and academic challenges of college life, such as time management, study habits, staying healthy, making new friends, goal setting, and much more. It's all about your child strengthening resilience skills to help him or her adjust to these new challenges and to keep going in the face of adversity. The curriculum was developed by psychologists in collaboration with professionals from ten colleges and universities. SCoRE is available for your child as a self-paced, online course. Read more about the program. How will my child benefit from SCoRE? Find out more about how SCoRE has helped students. Set your student up for success! The SCoRE self-paced course is available for just $19.95 for lifetime access.